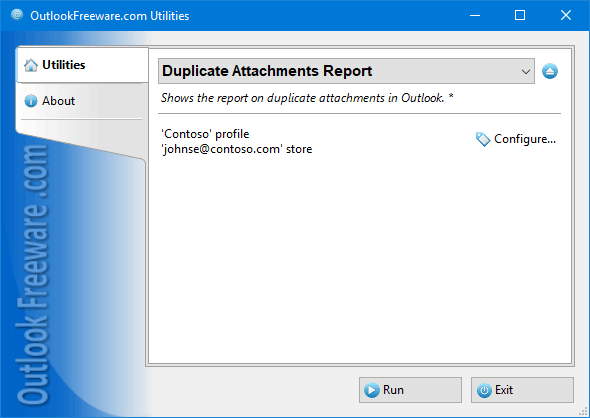 This free report allows you to check Outlook for existence of identical attachments in mailboxes (duplicate attachments). After verification, you will receive a detailed report on the number of duplicate attachments, their location and size. If needed, you can find attachment duplicates or delete duplicate attachments using our tools.When you actively send files by email, duplicate attachments can take a significant portion of space in your mailbox. Not every company can afford to host such a volume of data. This report will help you estimate the place occupied by redundant data. In addition, the same files may have different names and vice versa. All this leads to confusion and loss of productivity.This utility compares the contents of attachments in email messages and other Outlook items, and displays a detailed report. The resulting report can be saved into a CSV spreadsheet file, copied, and opened in other programs. The program is easy to install and use: select Outlook folders to search for duplicated attachments, specify the desired Outlook item types, and run the program. The report allows you to use file masks (for example, to get the report on duplicates of Word documents only, type the *.doc? mask). If necessary, specify the date range.This unique utility indicates the problem of free space waste in Outlook mailboxes and PST data files. The report is part of a comprehensive solution for optimizing free space in Outlook. Thanks to the support of the command line, you can provide the centralized control of unneeded files in user mailboxes and Exchange Server public folders.